The procession is bright, feathery, and full of festive spirit. The procession is bright, feathery, and full of festive spirit. Groove along on Saturday, June 25. WELCOME SUMMER: There's no one correct way to approaching the start of summer, though many people do tend to stock up on sunblock, and pool noodles, and flip flops, and board shorts, as they should. But greeting the summer solstice specifically, and not summer as a whole, is another merry 'n magical matter altogether. Some solstice observers rise with the dawn, to get the most out of the longest day of the year, while others take a nature hike, or find a bluff or mountain rock for some prime sunset watching. Those are quieter happenings, pursuits that truly fall on the more introspective side of the solstice. WILDER WHIMSY: But on the extrospective side of the occasion? 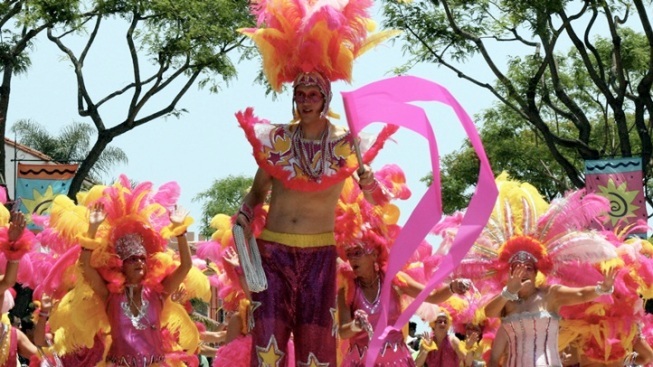 It's the Santa Barbara Summer Solstice Celebration, a gigantic street parade that has roots back in 1974. This isn't a reflective and silent sunset walk, note, but rather a middle-of-the-day, music-packed parade. A parade, by the by, which comes complete with some of the most colorful costumes to be found in the Golden State, outlandish and fun outfits donned by the 1000+ participants shimmying their way down State Street, as well as surrounding thoroughfares. FLOATS, TUNES, and "choreographed dancing ensembles" fill out the festive scene further. It's a scene that summons the sunny side of the solstice, though do keep in mind that the 2016 party is not happening on June 20, the longest day of the year. Rather, the parade is set for Saturday, June 25, while the larger festival will kick up its heels from June 24 through 26. Workshops have been helping to get everyone involved in the community-darling to-do, so you're bound to see some people who are walking in their first-ever parade. It's full of cheer, hula hoops, inflatables, streamers, smiles, and summery whimsy, all things that Santa Barbara pretty much rocks all year long. But at its long-running Summer Solstice parade? It is like the sun itself has provided a little extra light, and a spare sunbeam or two, to the light-in-spirit gathering.